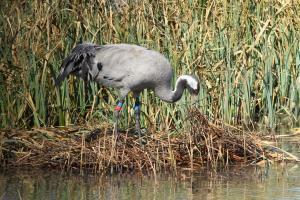 Home » Blogs » 's blog » The first of the Great Crane Project birds display nesting behaviour! 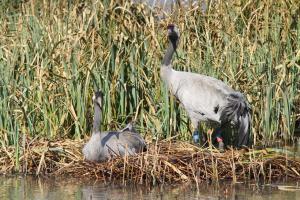 The first of the Great Crane Project birds display nesting behaviour! In the last couple of days there has been a great deal of excitment at WWT Slimbridge. Two of the four birds which have been visiting the WWT reserve reguarly in the last few months have started to show signs of nest building! We are exceptionally lucky that they have chosen to do this right infront of one of the bird hides so we can watch the process without disturbing them! To begin with the group of four were all present (3 females and 1 male) and were helping to gather nesting material, but once the nest took on a better form, the pair chased away the other two females and then returned and carried on adding to it. They have also had to battle with a mute swan, who seemed keen on taking over the nest, but the cranes seem a hard pair to beat and the swan retreated! This pair are from the 2010 group of releases (Monty and Chris) and so at three years old are at breeding age. This nesting behaviour doesn't mean they will definately lay eggs successfully, as they are still a young naive pair, but it is very encouraging that they are at least starting to practise breeding behaviour. It is an exciting start to yet another chapter in the Great Crane Project! For anyone in Somerset, keep your eyes peeled for any signs of breeding behaviour in the birds down there, as it is much harder to keep an eye on a bigger group which are spread over a large area. Fingers crossed we will discover the same behaviour taking place down there too! Below are some images taken by James Lees, one of the reserve wardens at WWT Slimbridge. Chris (the female) adding material to the nest, and then the pair (Chris and Monty) after having chased the others away.